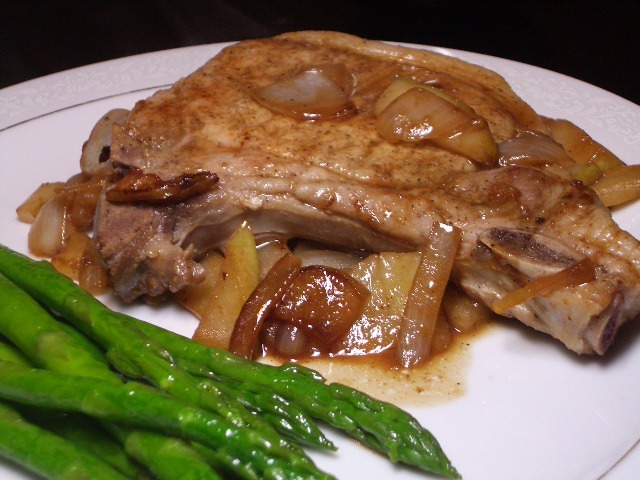 Get your pork chops out of the fridge about 20-30 minutes before cooking. In a small bowl, mix together your spices, and then rub each side of the pork chops with the spice mixture. Coarsley chop the onion and thinly slice the pear. Heat the olive oil in a stainless steel skillet (don’t use non-stick for this recipe — it may look like a mess when y0u’re cooking it, but it’s worth it for the caramelization!). Add the onion and cook for 4 -5 minutes or until soft. Now add the pear and cook for another two minutes. Clear spots for the pork, add the chops, and cover with the onions and pears. Cook pork chops on each side for 4-5 minutes (depending on the thickness of your chops). As the juices cook off from the pork, the pears and onions will begin to caramelize. Remove the chops when they reach about 135 degrees internal temperature and let rest for 10 minutes. Serve over the onions and pears and ENJOY!